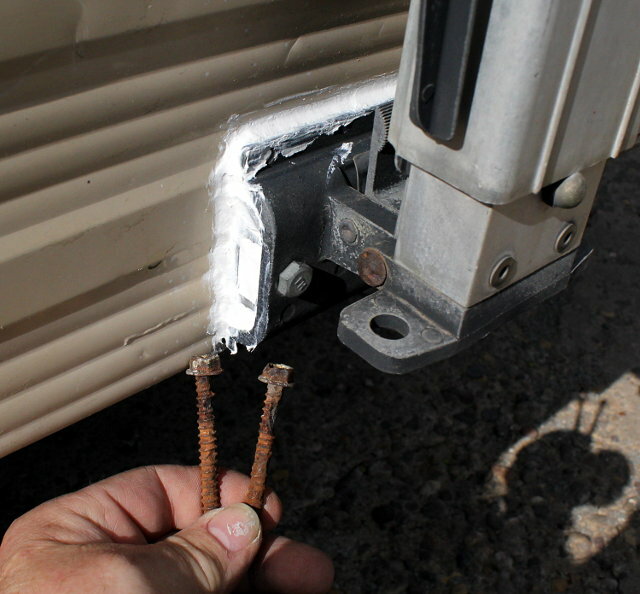 I hadn't noticed before, but the lower awning brackets on our T-1350 were starting to loosen. I found it after we got back after the weekend's jaunt. We went through several miles of heavy rain, and after we got home I checked her out for any signs of leakage - especially around the side windows and the Jack antenna I just installed. Not a trace of water, but I did see the bracket problem. I opened the awning in patio mode and pulled the brackets. The lag bolts they used had gotten pretty rusty and were eroding way too much for my tastes. I gave the bracket and sheet metal a good cleaning and slapped on a layer of butyl tape before putting them back on - with new (and larger) lag bolts. After making sure they sealed good and were solid, I got out the calking gun. I only calked around the top and sides of the bracket. Here is a shot of the lag bolts from one of them. (I didn't think to get a "before" pic, sorry.) After the calk cures good, I'll paint over the repair so it won't look so bad. Hopefully, I won't have to mess with this again for a while. Those lags being rusted the entire length points to moisture somewhere in its life, it was wet or starting to wick in. Since your new ones I'm assuming did bite into solid wood, you may have lucked out to get this early enough. It is common to see the lower lags not tighten up. The wood is gone after water wicked in the screw threads. I've thought about that a few times too, John. It still felt pretty solid with probing, but it still sticks in my mind. I don't know what the lags were made of or how they were finished, but I'm hoping that there wasn't much getting in there, just enough to cause the rust. I know the PO kept it inside, as we do now. Most of the time it's like a kiln around here - humidity down around 10% or less. I'm hoping there isn't any unseen damage. Wouldn't be able to do any major repairs like that. I will keep an eye open for any signs.